More than half of South Koreans believe their national football team will fail to advance from the group stage of the ongoing FIFA World Cup in Russia, a poll showed Monday. 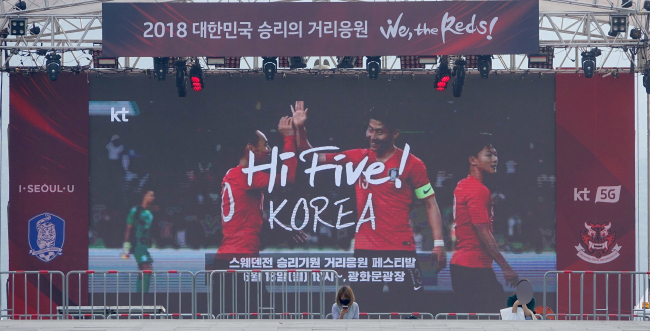 In a survey of 500 South Koreans aged 19 or older by Realmeter, 54.7 percent said they didn't think South Korea would survive Group F. South Korea will open their campaign later Monday against Sweden, and will face Mexico on Saturday and Germany on June 27. At 57th in the world, South Korea are the lowest-ranked team among the four and are widely considered the biggest underdogs in Group F.
In the poll, 37.7 percent said South Korea will make it past the group stage. Of those, 27.4 percent said South Korea will be eliminated in the round of 16, and 6 percent said the team will reach the quarterfinals. Another 1.5 percent said South Korea will advance to the semifinals, and 2.8 percent said the team will play in the final.